Rebellion is a creative act of solidarity between non-binary artists, and women human rights defenders around the world. In the 100th anniversary year of the Suffrage movement - women around the world are still rising up to fight for their rights. 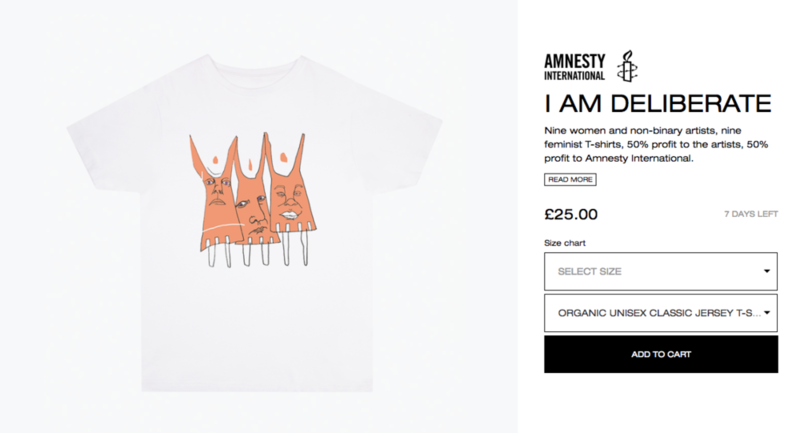 Amnesty teamed up with Everpress and nine women and non-binary artists to produce nine feminists t-shirts with 50% of profits going to artists and 50% going to Amnesty women’s campaigns. I wanted to depict unity in the face of adversity in this piece, which is why I named it after the Audre Lorde quote "I am deliberate and afraid of nothing" in order to demonstrate the unity we embody when we engage in truly intersectional feminism. The subjects in the piece are all holding hands in a childlike way, reminiscent of the ring-o-ring of roses dance, in a way which I hope demonstrates the simplicity of the united message.